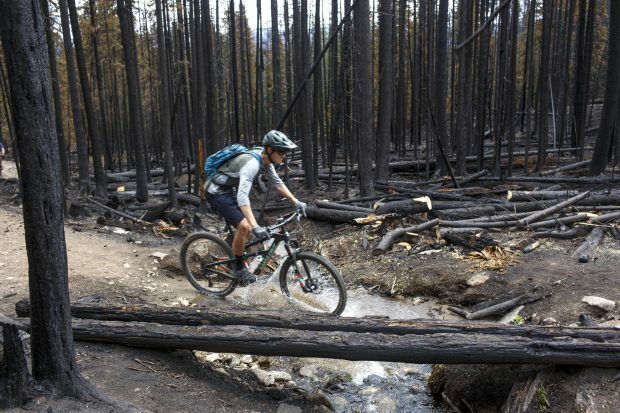 Summit County resident Camden Latimer pedals through a burned forest on Miners Creek Trail on July 25, 2017, caused by the Peak 2 Fire earlier this month near Breckenridge. 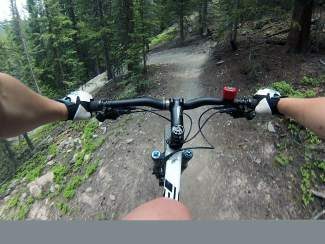 SUMMIT COUNTY — Mountain biking on four-wheel roads can get a bad rap. 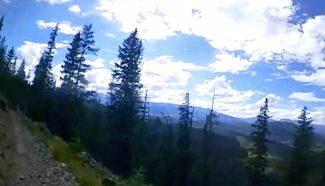 For purists, they’re usually dusty, crowded with motorized vehicles and, on occasion, just plain boring compared to singletrack. Miners Creek Road is an exception to the rule. 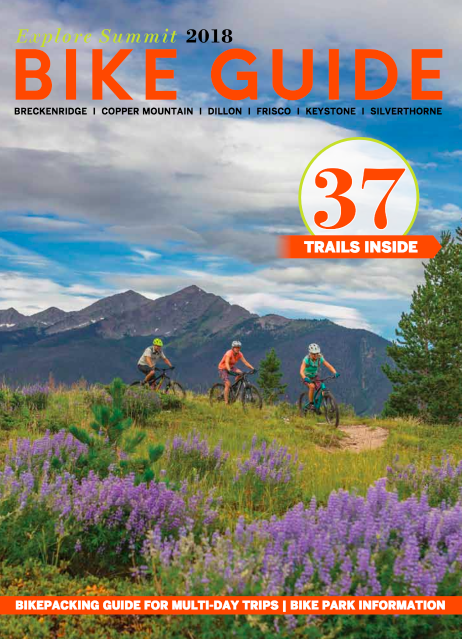 Providing quick access to a network of singletrack trails on the south edge of Frisco, Miners Creek Road winds past beaver ponds and a meandering creek as it climbs toward the Tenmile Range and, eventually, Wheeler Trail to Copper Mountain. The road is lined with a combination of aspens, pines and thick underbrush, making it a pitch-perfect ride in September when Rocky Mountain foliage is at its best. It’s also leads directly to the site of the Peak 2 wildlire, a man-made blaze first spotted in the dry hours after Fourth of July — one of the busiest times of year in Frisco and Breckenridge. The wildfire spread for several days, burning nearly 90 acres of dead and dying beetle-kill pine. The U.S. Forest Service has re-opened the road, but rangers still caution bikers and hikers about leaning trees left from the fire. 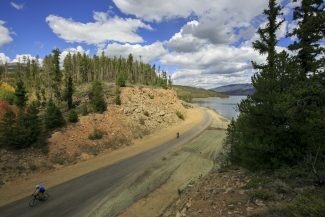 From Miners Creek, riders can access a slew of rocky, rooty, iconic rides, including portions of the Peaks Trail, South Rainbow Trail, Bill’s Ranch Trail and Gold Hill Trail. Routes like Peaks and Gold Hill are long excursions when you ride them from start to finish, but thanks to Miners Creek Road, riders can create a nearly bottomless series of loops that never leave the Frisco area. It’s time to give this road a chance — you won’t regret it. Note: The part of the road described in this ride is usually dry enough to ride by late May or early June, although the water might be high at two creek crossings. This road is popular with off-roaders and four-by-fours. Expect occasional Jeep traffic. Camping and campfires are allowed 0.25 miles up from the trailhead. From the trailhead parking lot, ride south past the gateposts and up a short paved path. Cross the Frisco recpath and get onto Miners Creek Road, a dirt road that swings left and climbs. You’ll pass a lot of spurs forking off this route, but the main road remains obvious. The road curves to the right, where a couple of spurs, blocked by rocks, fork left. Continue climbing on the main road until you eventually cross over Miners Creek. Climb briefly, passing a fork to the right. This fork leads to short loops like South Rainbow Trail and Bill’s Ranch Trail — both of which eventually descend into Frisco and connect with the paved recpath. Continue climbing along the main road as it meanders along the creek and through a shady pine forest. Pass several campsites and, at about 1.3 miles, splash through a creek. Climb more and cross another creek at roughly 2 miles. After another half mile or so, the road curves right and starts climbing sharply. A short distance up this first steep hill, the main road forks left to connect with Miner’s Creek Trail and the Peak 2 burn area. An extremely rocky side road continues straight before eventually ending about 0.5 miles up. This junction is the recommended turn-around point. The road narrows, turning incredibly steep and rocky before ending after 1 mile at the upper Miners Creek Trail trailhead. Miners Creek Trail is a rugged section, similar to portions of Peaks Trail. It qualifies as an advanced bike ride. The trail eventually connects with the Wheeler Trail after 4.8 miles of grinding on an uphill grade. From Interstate 70, drive through Frisco on Highway 9. Just south of town, turn right at the stoplight onto Peak One Boulevard (County Road 1004). After a few hundred feet, take the first right at the Miner’s Creek Road/Bill’s Ranch sign. Take an immediate left and drive up a narrow paved road a short distance. This paved section is open to bikes and other rec users. Use caution. 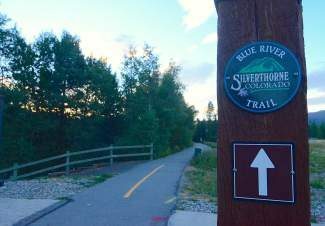 Park at the trailhead and pedal up the paved path about 0.25 miles to the intersection with the Summit County recreation path. Miner’s Creek Road is on the left after crossing the path. Editor’s note: This guide first printed in August 2016 and is annually updated for accuracy.